Table flower is one type of flower decoration model that we produce at Natalia Florist with the best quality and varied model choices. Table flowers are often used for decorative flower displays that are often displayed on the guest table, reception desk and office desk. 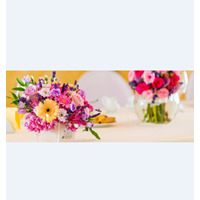 This table flower usually uses a type of flower that is durable and generally a series of various types of table flowers is inserted into a table flower vase to facilitate its placement and the table flower arrangement becomes more beautiful. Table Flowers 4Table flower is one of the home accessories in the form of flower arrangement and placed on vase then placed on the table as decoration. This product gives a beautiful and beautiful impression on your room. Compiled by a professional workforce and qualified so that has a high artistic value. We also provide various kinds of Decorative Flowers and other wreaths on request.Natalia Florist Is an Online Flower Store Established Since 1995, located in surabaya, we are engaged in florist, we are ready to serve all kind of Flower arrangement and ready to serve you 24 hours on time. We have a commitment to always provide the best service for you, We Serve For Java Region Bali.We employ experienced experts in the field of florist, so that the final result of the work is perfect and satisfying the customer. Hopefully we are given the opportunity to prove directly to you to do what you need.Happy Shopping At Our Flower Store Online, Please contact our CS for more info contact us. Artificial Plastic FlowersDifference between artificial flowers and fresh flowersFlowers are the main element in the wedding. Starting from your bouquet, corsage family, corsage committee, standing flower, groom's boutonniere, to wedding decorations. Many brides claim to spend 8-10% of the cost of marriage only for flowers. Many vendors mixed with artificial flowers for several reasons.However, bridal bouquet gets special attention from the bride and groom. This is because the hand bouquet will always be next to the bride herself while sitting in the aisle and photo session. The type of interest will be further consideration. The use of artificial flowers is now common because of the shape and color are very similar to fresh flowers.Reasons for choosing artificial or artificial flower arrangements:a. Artificial flowers will never wither or change color, so they are always visible b. Always there at all times, without having to wait for the flowering season. c. Light and easy d. Cheaper price than fresh flower arrangements. e. It is easier to maintain, and no special handling is needed such as fresh flowers. f. Artificial flowers do not cause allergies, so they do not cause health problems at all. g. Atificial interest is not affected by weather, room temperature, and so on. The flower parts will remain intact as h. Artificial flower arrangements will not attract insects or bees that interfere with the appearance of flowers. Regarding which one is better, a series of fresh flowers or artificial flowers. Of course the matter must be seen from our needs and budget first. Both are good if you know the right handling. So choose one that suits your needs and budget. Artificial flowers Plastic flowers or artificial flowers are an imitation of the original flower plant, used for office, shop, hotel or residential decoration. 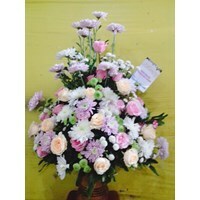 Lay people in Indonesia are more familiar with the term plastic flowers to refer to artificial flowers. Though fake flowers are not made of plastic. In the history of materials used to make artificial flowers, namely linen, gold and silver, paper, cocoons, feathers, shells, soap, clay, glass and candles.Plastic flower Injection molding is used for mass production of plastic flowers at the factory. Plastic material is inserted into metal molds to form parts of flowers. Then the parts are arranged into whole flowers. Lack of plastic flowers is a material that is rigid and not elastic so that from a visual appearanceit seems that the flower is fake. 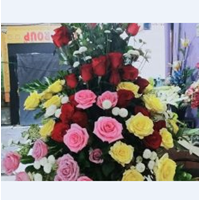 The advantage is the relatively cheap price.Polyester flowers Polyester is the main ingredient for making artificial flowers since the 1970s. Most artificial flowers on the market today are made of polyester fabric. 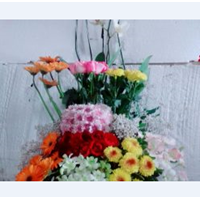 The main producer of artificial flowers at present is China which has hundreds of artificial flower factories in the Guangdong area that were built in the early 1980s. Thousands of polyester flower containers and other plastic plants are exported to almost all countries every year.Nylon flowers The art of making nylon flowers is quite easy using simple tools and cheap materials can achieve amazing results. The basic materials needed to make nylon flowers include wire, wire rod, nylon stockings, nylon thread, white glue, acrylic paint and brushes. Nylon flower making is popular in the United States and Japan in the 70s. In recent years, the popularity of nylon handicrafts has spread to Asia, Europe and Australia. With the advent of new materials and colors, the art of making nylon flowers will continue to grow.Silk Flower (Silk Flower) bunga-plastik-anggrek-bulanBunga Sutera is made of silk which makes flowers and all parts of the plant look more alive like the original flowers. Now silk flowers have used special techniques that give the plants a fairly realistic look. Bunga Sutra is very popular in the United States because it has the advantage of being resistant to fire. Table Flower 8Flower decoration is one form of decoration that gives the feel of feminine and beautiful. Table flowers are often used as home accessories in the form of flower arrangements and placed on a vase and then placed on the table as decoration. This product gives a beautiful and beautiful impression on your room. Compiled by a professional workforce and qualified so that has a high artistic value. 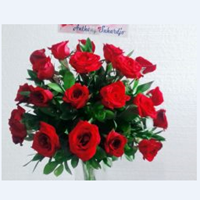 We also provide various kinds of Decorative Flowers and other wreaths on request.Natalia Florist Is an Online Flower Store Established Since 1995, located in surabaya, we are engaged in florist, we are ready to serve all kind of Flower arrangement and ready to serve you 24 hours on time. We have a commitment to always provide the best service for you, We Serve For Java Region Bali.We employ experienced experts in the field of florist, so that the final result of the work is perfect and satisfying the customer. Hopefully we are given the opportunity to prove directly to you to do what you need.Happy Shopping At Our Flower Store Online, Please contact our CS for more info contact us. Table FlowersBasically flowers are a symbol of beauty.Flower tables are usually used for decoration on office desks and home tables.Here we will discuss some of the table flower functions, namely:1. as a home interior decorationused to beautify the guest table, work desk, office desk, and the corners of the room. With this table flower our house will look more colorful.2. To symbolize hope for recovery to people who are sick.3. To present a nuance of peace, calm and peace.Flowers can be real flowers (cut flowers) and artificial flowers (plastic flowers).A flower arrangement that uses a flower vase as a place for the series, table flowers can give a beautiful touch because of the combination of various types of flowers and colors in each series.The types of flowers used to make table flower arrangements usually use flowers with bright colors, such as lilies, roses, tulips, daisy daisies, gerbera flowers, orchids, baby's breath flowers and others. Buat Permintaan Untuk "Desk Flower"
Flower Decoration TableTable flower is one type of room accessories that banya used in the living room. We also provide various kinds of Flower Decoration and other Hand Flower Handmade on request. Table Flower 1Table flower is one of the home accessories in the form of flower arrangement and placed on vase then placed on the table as decoration. This product gives a beautiful and beautiful impression on your room. Compiled by a professional workforce and qualified so that has a high artistic value. 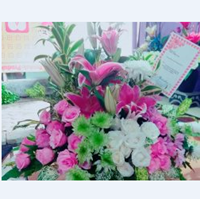 We also provide various kinds of Decorative Flowers and other wreaths on request.Natalia Florist Is an Online Flower Store Established Since 1995, located in surabaya, we are engaged in florist, we are ready to serve all kind of Flower arrangement and ready to serve you 24 hours on time. We have a commitment to always provide the best service for you, We Serve For Java Region Bali.We employ experienced experts in the field of florist, so that the final result of the work is perfect and satisfying the customer. Hopefully we are given the opportunity to prove directly to you to do what you need.Happy Shopping At Our Flower Store Online, Please contact our CS for more info contact us. Table Flowers 2We provide many kinds of flower decoration.Table flower is one of the home accessories in the form of flower arrangement and placed on vase then placed on the table as decoration. This product gives a beautiful and beautiful impression on your room. Compiled by a professional workforce and qualified so that has a high artistic value. 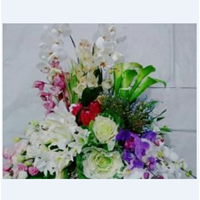 We also provide various kinds of Decorative Flowers and other wreaths on request.Natalia Florist Is an Online Flower Store Established Since 1995, located in surabaya, we are engaged in florist, we are ready to serve all kind of Flower arrangement and ready to serve you 24 hours on time. We have a commitment to always provide the best service for you, We Serve For Java Region Bali.We employ experienced experts in the field of florist, so that the final result of the work is perfect and satisfying the customer. Hopefully we are given the opportunity to prove directly to you to do what you need.Happy Shopping At Our Flower Store Online, Please contact our CS for more info contact us. Table Flower 3We use the type of quality flowers for our products.Table flower is one of the home accessories in the form of flower arrangement and placed on vase then placed on the table as decoration. This product gives a beautiful and beautiful impression on your room. Compiled by a professional workforce and qualified so that has a high artistic value. 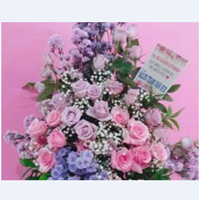 We also provide various kinds of Decorative Flowers and other wreaths on request.Natalia Florist Is an Online Flower Store Established Since 1995, located in surabaya, we are engaged in florist, we are ready to serve all kind of Flower arrangement and ready to serve you 24 hours on time. We have a commitment to always provide the best service for you, We Serve For Java Region Bali.We employ experienced experts in the field of florist, so that the final result of the work is perfect and satisfying the customer. Hopefully we are given the opportunity to prove directly to you to do what you need.Happy Shopping At Our Flower Store Online, Please contact our CS for more info contact us. Table Flowers 5Flower table is a kind of floral decoration that can support the fashion interior of your room. Being one of the home accessories in the form of flower arrangements and placed on a vase then placed on the table as decoration. This product gives a beautiful and beautiful impression on your room. Compiled by a professional workforce and qualified so that has a high artistic value. 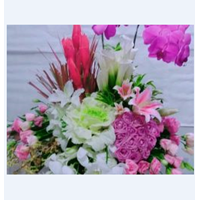 We also provide various kinds of Decorative Flowers and other wreaths on request.Natalia Florist Is an Online Flower Store Established Since 1995, located in surabaya, we are engaged in florist, we are ready to serve all kind of Flower arrangement and ready to serve you 24 hours on time. We have a commitment to always provide the best service for you, We Serve For Java Region Bali.We employ experienced experts in the field of florist, so that the final result of the work is perfect and satisfying the customer. Hopefully we are given the opportunity to prove directly to you to do what you need.Happy Shopping At Our Flower Store Online, Please contact our CS for more info contact us. Table Flower 6Table flower is one of the home accessories in the form of flower arrangement and placed on the vase then placed on the table as decoration. This product gives a beautiful and beautiful impression on your room. Compiled by a professional workforce and qualified so that has a high artistic value. 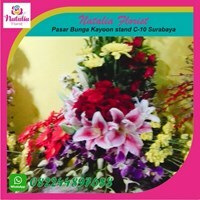 We also provide various kinds of Decorative Flowers and other wreaths on request.Natalia Florist Is an Online Flower Store Established Since 1995, located in surabaya, we are engaged in florist, we are ready to serve all kind of Flower arrangement and ready to serve you 24 hours on time. We have a commitment to always provide the best service for you, We Serve For Java Region Bali.We employ experienced experts in the field of florist, so that the final result of the work is perfect and satisfying the customer. Hopefully we are given the opportunity to prove directly to you to do what you need.Happy Shopping At Our Flower Store Online, Please contact our CS for more info contact us.